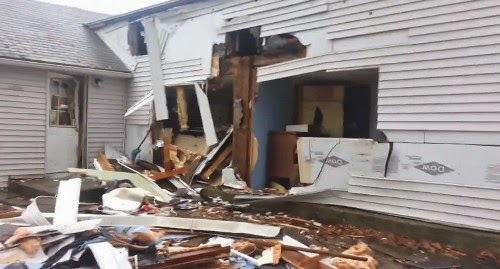 A New York family has been left homeless after law enforcement agencies effectively destroyed their entire house in the process of serving a warrant for a DUI.The Ithaca Journal reported this week that 36-year-old David M. Cady Jr. had died after being barricaded in his home for three days.After Cady missed court dates for a DUI over the summer, a warrant had been issued, and the Tompkins County Sheriff Ken Lansing said that the suspect was convinced that he would go to jail. Authorities said that they had reason to believe that Cady had been traveling to Pennsylvania to purchase ammunition so he would be ready when deputies arrived. Deputies attempted to serve the warrant at around 7 p.m. on Dec. 30, which led to a three day standoff with Cady. Autopsy results later indicated that Cady died of a self-inflicted gunshot wound. The suspect’s wife, Melissa, and two sons were not harmed. Video that began circulating on Tuesday showed the damage caused to the Cady home when the 18 law enforcement agencies decided to go in after the suspect.The home, which easily could be mistaken for one that had been destroyed by a tornado, appears to have no external walls intact in the video. Some walls are only partially missing, while others are completely gone. The yard is scattered with shards of wood, windows, insulation and family belonging. Inside the home, food can still be seen sitting on the stove, but the kitchen and most of the other rooms are open to the outside elements. Up to 150 law enforcement and emergency personnel reportedly participated in the operation.In a statement on Tuesday, the Tompkins County Sheriff’s Department said little about the damage to the house.“Eventually, law enforcement knew and anticipated needing to enter the residence, in order to take the subject into custody,” the statement insisted. “Based upon the information being developed through interviews and practices used by other agencies in the past, it became necessary to breech part of the outside area of the house to ensure the safety of all involved.”Danby Federated Church pastor Ed Enstine told The Ithaca Voice that the Cady family was now homeless. “She really has lost all the stability in her life in one fell swoop, so she will have to go through quite a period of readjustment,” Enstine said of Melissa Cady. “It’s pretty traumatic — this is awful stuff we’re dealing with.”According to the pastor, Cady’s wife worked in the service industry and had little extra money to recover from the tragedy. “She’s basically lived her own life and worked and doesn’t take handouts very easily, but in this case she’s basically back to square 1 … square 0, at this point,” he explained.The church was planning a chicken and biscuit dinner on Friday to take donations for the family.“We’re all just trying to figure out how to do something,” Enstine noted, adding that the church had already given her a small amount of money to get by.“She’s going to need a lot more than that,” he said.Watch the video below, uploaded to YouTube on Jan. 6, 2015.